I am conducting a biodiversity survey for la réserve naturelle de la Chérine to see what species of Diptera (flies) there are on the reserve. One of the things we are interested in is the difference in diptera species present in a number of fields which are managed in different ways. 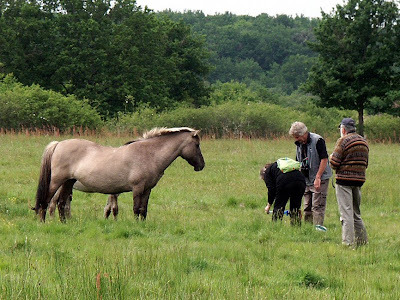 This field is grazed by Konik Polski (Polish Ponies), who took a great interest in our activities (or, more likely, a great interest in the possibility that we may be carrying tasty pony treats). Koniks are the closest breed we have today to the extinct wild horse, and are increasingly popular on reserves which need large grazing animals to maintain the status quo of grassland habitat. Without grazing, this field would revert to scrub. 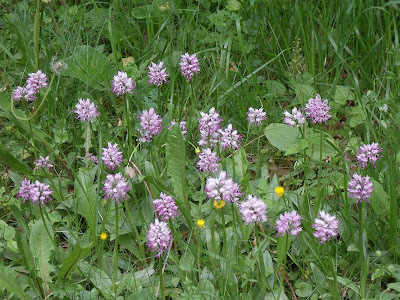 With these thoroughly charming ponies in residence, several species of rare orchid and a rare umbellifer are able to compete because the grass is kept shorter and the scrub eaten or trampled before it can take over. Please note that access to this field is restricted to authorised persons only, and not open to the public. This is particularly important as many species of birds are breeding in the area, and the ponies have new foals. We had to take care not to disturb ground or hedge nesting birds and keep a respectful distance from the two day old foal so as not to upset its mother, who was clearly still keeping her baby away from the rest of the herd. The ponies you can see in the picture above are a somewhat older foal from this year who is allowed to explore and investigate a bit by his Mum, and one of last year's progeny, now quite independent. The lawn is resting. In this park, below Sacre Coeur in Montmartre, it rests over winter from 15 October to 15 April. This means that you may not step on it, much less sit on it during that period. If you do a policeman or gardener will shout, whistle and gesticulate angrily at you until you step away from the grass. 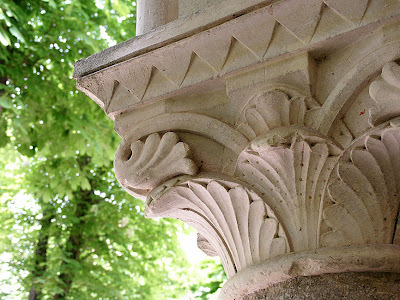 The first time I came across this expression was in Place des Vosges, which is quartered. The gardeners very sensibly allow each quarter to rest in rotation so that the grass gets some time to recover from the pounding of so many tourist feet and is not just a mud or dust bowl. In autrefois, the lawn in Parisien parks was for looking at only. No lines of desire here - not even a bit of lazy corner cutting permitted. Putting a toe over the edge of the path to take a photo of a pretty garden bed meant being threatened with arrest or deportation (not really, but it must have seemed like that to any non-French speaker exposed to the ferocious verbal style of a passing gendarme). 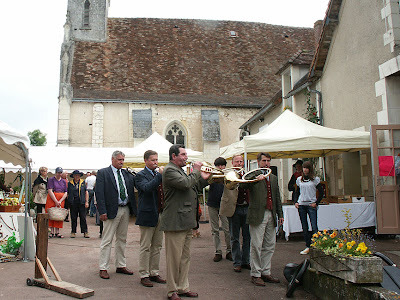 At the Boussay fete the local Trompettes de Chasse emsemble played. The trompette de chasse is a hunting horn which has no valves (thus making it a "natural" horn). This means that any change of note can only be done by changing the embouchere (the shape of the lips) and the force with which you blow - although some additional note can be found by pushing your spare hand in the bell (the big horn bit). The basic notes obtainable are all harmonics of the natural tuned length of the tube. (For more info on harmonics in a tube, read this). Trompette players all learn in the traditional way - from a member of the family or a friend. There is no formal lesson structure, so all players play slightly differently. Also, the tunes are not written down - so they are passed, along with technique, from generation to generation. The tunes do not fall into the standard western (classical) tradition of harmony or timing, so this makes the calls sound ancient and slightly foreign. None of the tunes are very long - about 20-30 seconds, and then they all stop to discuss what is going to happen next. This is in the fine tradition of brass players everywhere, who like to stop for wine or beer as often as possible. There is a Trompette de Chasse concert at Boussay Chateau in July. If I can organise myself sufficiently I would enjoy seeing that. Recently we had a few days in Paris, and I arranged to meet a contact, Pierre, who lives and works very close to Montmartre Cemetery. He very kindly took time out from his translating work to give us a guided tour of the Cemetery. 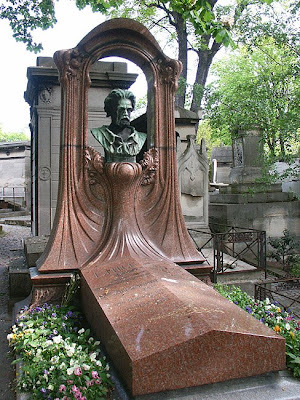 Not perhaps as famous as Père Lachaise, it is nevertheless the final resting place of many names you will recognise, and one can spend a fascinating couple of hours looking at all manner of monuments and tombs. It is still an active cemetery, and plots are expensive to buy and must be maintained or they are resumed. Pierre has spent his lunch hour here almost every day for many years, mostly photographing and observing insects, but also just enjoying a wonderful hidden peaceful place. He told me that when his children were babies, he would bring them here for their afternoon bottle because it was somewhere calm where they would not be disturbed or distracted. Curiously, the cemetery only has one entrance/exit, and I think this is what deters many locals from using it more like a park rather than the fact that it is a cemetery. It is not somewhere you use as a pleasant shortcut, it is necessarily a destination in its own right. 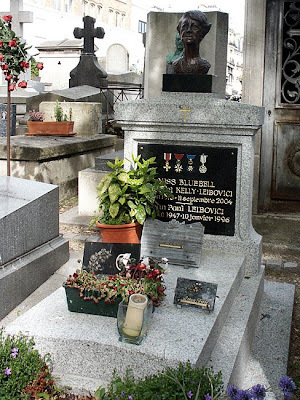 One of the first graves you come across is that of Emile Zola, the writer. He died in 1902, but a few years later, his body was moved to the Panthéon to join other national heroes. 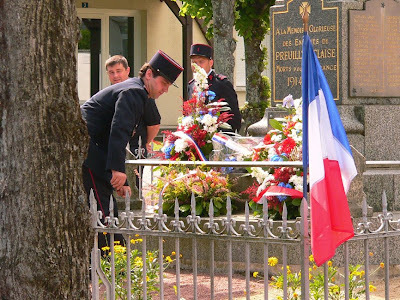 Like the big London cemeteries such as Kensal Green, the one in Montmartre is a 19th century creation which came about in response to a need to improve conditions in the capital. Because of its location, many of the occupants are the artists, writers and performers that the area is famous for. 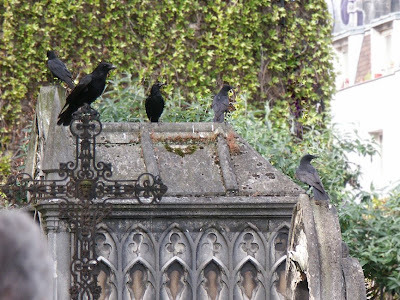 A group of resident crows gather on a Gothic Revival tomb. Being crows, I imagine they are entirely aware of the effect they produce. The tomb of Margaret Kelly-Leibovici, who founded the Bluebell Girls cabaret troupe. 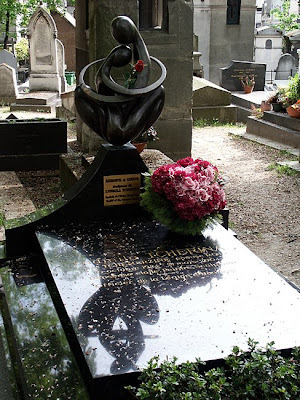 The grave of Ludmilla Tcherina, ballerina, sculptor and painter. 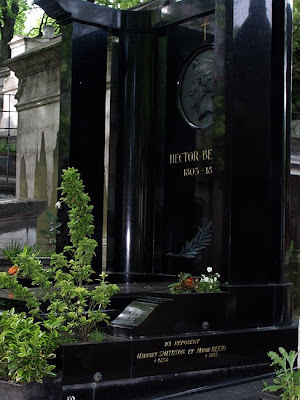 The composer Hector Berlioz, buried with his wife and his mistress. Simon thought this showed real style, but in fact, Marie Recio did become his second wife. Berlioz apparently wrote to his son that he had lived with her for so long he felt obliged to marry her after Harriet Smithson's death. It is apt that he is buried here, as he seems to have spent many hours walking about in the cemetery, which was close to his home. A quiet week this week - at least as far as building goes. Susan's parents are still here, so we have been off exploring - Villandry, Le Blanc, Montrésor, Chenonceau and the Brenne are all names which will appear once we have the time to sit down, gather our thoughts and write - as are items about orchids (5 new ones for us this year), butterflies, birds and flies. On our way to Villandry we stopped for lunch at Chambray-les-Tours, a large area of hardware and furnishing shops and car yards just south of Tours. While we were there we took the opportunity to have a quick browse through some kitchen places. There weren't many kitchens we liked, but we were interested in some of the things that have happened to kitchens in the 20 years since either of us had to plan one. Susan's father was particularly interested in the range of items available in hardware that he hasn't seen in Australia. 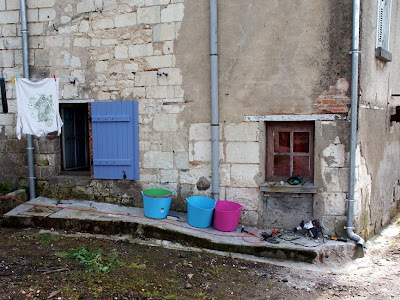 A French man will, with very little pushing, build an extension on his house all by himself - buying pre-made (and pre-hung) doors, windows, shutters, do all his own wiring and plumbing, and finish off with some plastering. I hope I develop at least some of these skills! Having Susan's parents here has meant that I haven't been spending all day at the house, which means I have had plenty of opportunity to take some photos. Robinia pseudoacacia is known as Acacia in France. Of course, as a good Australian, to me this tree is False Acacia. Real Acacia or Wattle, is Australia's national flower, and in France is called Mimosa. A couple of years ago the taxonomy police mounted one of their regular campaigns to split the genus Acacia which would result in many being renamed. The type species ie the first Acacia to be scientifically described, is in Africa. Traditionally, when renaming and splitting of a large genus occurs (there are about 1300 species of Acacia worldwide) the type species is the one to retain the original name. But there are precedents, when there are good arguments against going with 'tradition', where the type species fails to retain the old familiar name and it goes to a more newly described species. Many Australian botanical taxonomists, and indeed, many ordinary Australians, outraged by the thought having to refer to Racosperma, argued successfully to the International Botanical Congress that as Australia has about 1000 of the world species, it made sense that the largest genus in the reclassification should be allocated the coveted name. Part of the reasoning behind this was entirely pragmatic - it is a time consuming and expensive process renaming herbarium specimens and what about all those field guides and gardening books put instantly out of date, if not obsolete? However, all of this is a distraction from the main topic at hand, which from now on I will refer to by its 'proper' name of Robinia. 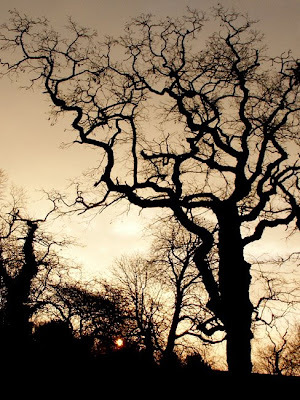 In the UK it used to be known as Black Locust, or often, just Locust Tree. 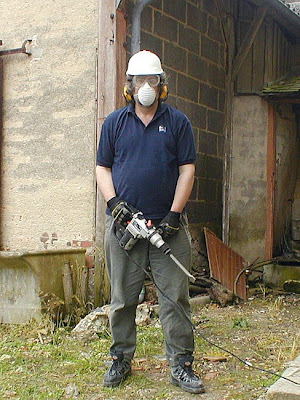 Where we live in England is in what is called a 'Conservation Area' (meaning that the village has many buildings of architectural and historic significance, and permission must be sought to make alterations to ensure the area is maintained sensitively). This protective regulation doesn't just cover the buildings and infrastructure. Many of the older and more impressive trees are 'listed' and (theoretically) cannot even be pruned without permission, much less cut down. A number of the listed trees in our area are Robinia, but it took me a while to figure this out. The listing was done in the 1960s, and surprisingly, scientific names were not used. Our Robinia are listed as Locust Trees, and as an Australian, a Locust Tree to me is Gleditsia triacanthos, a plant that is classified as a noxious weed, as it self-seeds so readily and escapes into the bush. No wonder I was confused. A Robinia in the churchyard next to our house in England, taken early one winter morning Regular readers of our blog may be interested to know that Robinia pseudoacacia was introduced to the UK c1630, the same time as Cedar of Lebanon. 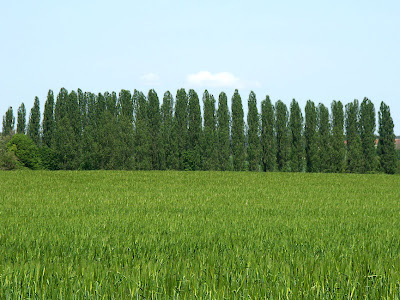 Like Cedar of Lebanon, Robinia came to France earlier than to England. 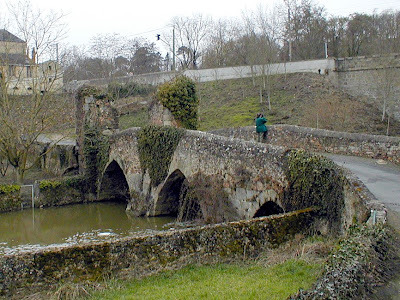 It arrived sometime before 1606 and was grown by the royal gardener Jean Robin. It is very fitting that the tree now bears his name, as by the time it was introduced to England (as a gift from Robin to John Tradescant Senior) it was thriving in the Louvre garden established by Henri IV and as those familiar with the French countryside will know, is now naturalised throughout France. It flowers May-June, and veils many a French woodland in its fragrant white clusters of pea-flowers. Robinia casting its haze of flowers over the woodland across the river from Yzeures sur Creuse When it was first described it was classified as a Mimosa and named Acacia americana Robinii (it is native to North America). The flowers are very attractive to bees and miel d'Acacia is a very popular and widely available mild tasting honey in France. Always one of the last trees to come into leaf in the spring, in the autumn they turn yellow. 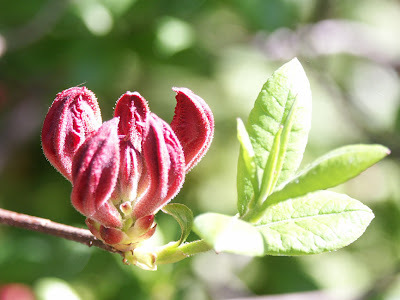 It turned out to be very tolerant of smoke and soot, so it was a popular park tree once the industrial revolution kicked in, and was frequently planted on railway embankments. 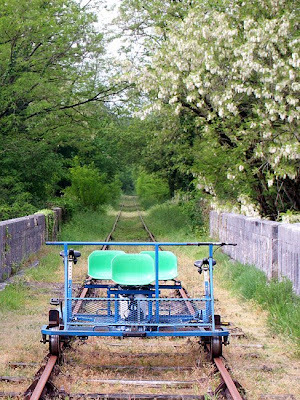 Robinia dangling over a disused railway line which is now a vélorail track To complete the rather circuitous nature of this narrative, I would like to add that when I was a child we lived on a farm in the Australian state of Victoria. In the home paddock there were two enormous and spreading False Acacias. I remember these as by far the biggest Robinia of my acquaintance, but, having never seen these trees after moving away, it is difficult to know if this is just a trick of childhood memory. As we are currently feeling financially constrained, one of the things we have both put off is having our hair cut in London. 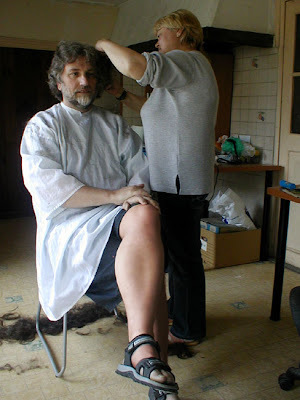 Luckily, our next door neighbour in Preuilly is a hairdresser and was not in the least dismayed when confronted by Simon's curly mop. 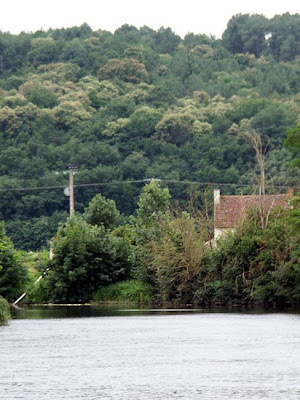 On the road just south of La Roche Posay is this weir and associated factory. 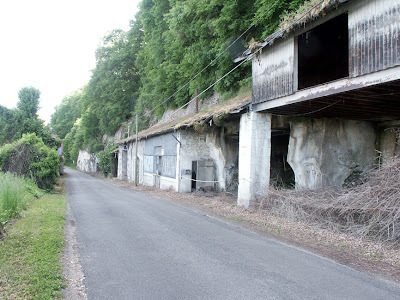 We will be doing some research on the factory and its history as it is an intruiging place - a long range of galleries carved into the living rock of the Creuse valley on one side of the road, with workshops, accomodation and offices on the other. The whole place is covered with signs saying it is unsafe to enter - and it looks it! We will be asking questions and reporting back. And the bugler plays the Last Post. A minutes silence is held and serving officers and other ranks salute and wreaths are laid. 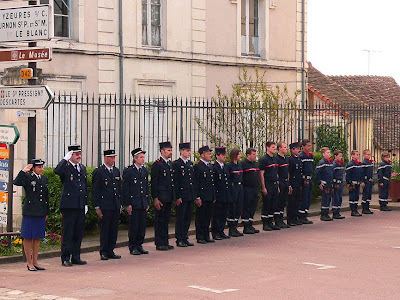 Revaille is played and then individuals, organisations and sporting clubs present gift books which are distributed to retirement homes or other charities, badges are sold to the public to raise money for widows and children of veterans. The main difference with the VE Day service is the reference made to remembering people other than service personnel who lost their lives due to war: civilians, resistance fighters, deportees, victims of genocide and those upon the sea. As Australians, whose country has never had enemy troops on our soil (some cities were bombed by the Japanese) it is hard for us to imagine just what it was like to live and survive in an occupied country. 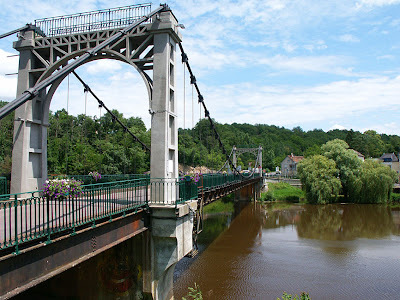 We go on from here to Normandy and the Somme before we fly back to Australia. 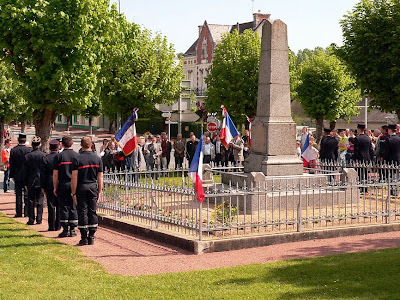 At Villers Bretonneux we will visit the Australian War Memorial and the Commonwealth War Graves where so many of our grandparents generation are buried on French soil as a result of the fighting to liberate France in World War I. So what does the ever-thrifty French housewife do with the scraps of pâte she is left with after making an apple shortcake? Well, she could make a little batch of sablés, like I did. 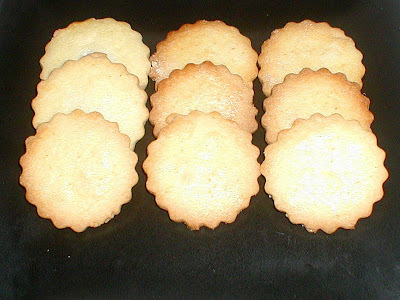 Sablés are a plain butter cookie that can be consumed as they are with coffee or sandwiched into pairs with the likes of lemon curd, chocolate hazelnut spread or ganache. They are completely ubiquitous in France, and every family has their own recipe. The word 'sable' means 'sand', so the name refers to their 'sandiness' (which doesn't sound promising, so think 'crumbliness' instead). They are very 'short' - in cooking parlance - which means a high ratio of fat to flour, giving you a very soft pastry that tears easily and once cooked, has a soft, crumbly, melt in the mouth texture, a bit like Scottish shortbread. You may be interested to know that one also 'sable le champagne' (breaks open the champagne). 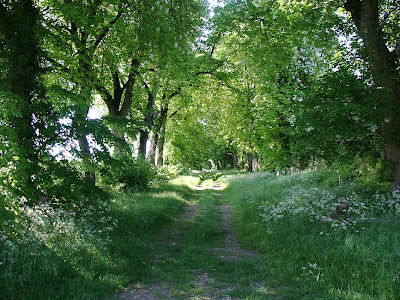 The old driveway to the Château de Boussay, an avenue lined with Horse Chestnuts, a cool and inviting scene. Hover Flies, or Flower Flies, as they are known in North America, are enormous fun to watch. As the name suggests, they hover, usually at a height between 50cm and 3m. They are quite visually oriented, so some of the males who hold territory will shimmy over to inspect you eye to eye if you enter their territory. They are not wasps and cannot sting or bite. They feed on nectar, and many species have larvae which feed on aphids. A recent British biodiversity study of urban gardens has revealed that Hover Flies are the second most numerous group of flying insects in the garden (after parasitoid wasps). 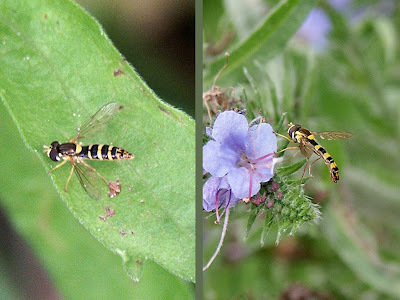 The photograph above shows the male (right) and female (left) of Sphaerophoria scripta, taken near Yzeures-sur-Creuse. Australians may recognise the plant the male is visiting as Patterson's Curse, otherwise known, in Britain, as Viper's Bugloss. In the French field guide this Hover Fly is described as 'corps étiré, très svelte, face brillante, jaune, à callosité médiane foncée. Mésonotum à bandes latérales jaunes qui s'étendent jusqu'au scutellum jaune mat' (body elongated, very slender, face shining, yellow, with dark facial stripe. Thorax with yellow lateral lines which extend to the matt yellow scutellum). They range in size from 9-12mm, with the males, unusually for flies, being longer than the females. This slender little fly is very common and in some years migrates long distances - the French population boosting the British from March to October. It likes open areas where the adults visit flowers and the larvae prey on aphids, so do encourage them in your garden as pollinators and pest controllers. 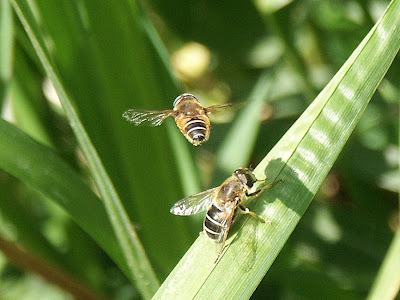 Above, this photograph shows a courting pair of the big Honey Bee-like Hover Fly Eristalis interruptus. The fly on the leaf is female, with the hopeful male hovering above. He is both waiting for a signal from her that mating may commence and guarding her against other interested males. It is not uncommon to see males stacked up like planes in holding patterns above a female. My French Guide des Mouches says that les éristales are 'syrphes ressemblant à des abeilles, aux yeux unicoloures velus, nervure r4+5 profondément échancrée au-dessus de la cellule R5, cellule R1 fermée, antennes plus courtes que la tête, arista velue (Drone Flies...Hover Flies resembling bees, the hairy eyes uniformly coloured, the 4th/5th radial vein on the wing deeply indented above the cell R5, cell R1 closed, antennae shorter than the head, arista hairy). They are 8-11mm and common on flowers from March to October, especially umbellifers. The larvae are known as rat-tailed maggots and live in water high in organic matter - sometimes to the point of being polluted, especially by large quantities of rotting plant material or manure. This photo was taken at Chaumussay on the edge of the river in amongst the Yellow Iris. Sphaerophoria scripta - 'sphaerophoria' indicates 360º vision; 'scripta' indicates something written (probably a reference to the yellow line down the side of the thorax). Sphaérophore notée - the French name means the same as the scientific. Viper's Bugloss or Patterson's Curse - 'bugloss' = 'ox-tongued'. The leaves are rough like an ox tongue, and the seeds look like a viper's head. Patterson is the name of the family who supposedly introduced the plant to their Australian garden, only to see it take over acres and acres of grazing land. The upside is that the apiarists love it, and protest vigorously when eradication programmes are mooted. Echium - 'viper'. Using the principles of sympathetic magic, because the seeds look like vipers' heads, the plant was considered to be a cure for snake bite. Buglosse ou Vipérine - 'ox-tongue' or 'viper-like'. Eristalis interruptus - 'eristalis' = 'very troublesome'; 'interruptus' = 'interrupted' - in scientific names this generally denotes a marking that looks like a broken line, but I can't figure out what feature the name refers to on this species. Iris pseudacorus - 'iris' = 'rainbow'; 'pseudacorus' = 'false Sweet Flag' - Acorus or Sweet Flag is another, unrelated, genus of sedge-like marsh plant with a superficial resemblance to I pseudacorus. L'Iris de marais - 'marsh iris'. Also the heraldic Fleur de lis. 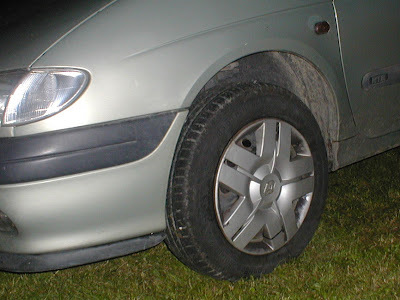 When I checked the tyre pressure last Thursday, I noticed that one of the front tyres had a nasty split in it. This was only recent, but it's the kind of thing that can happen when you drive on very narrow, sometimes rough roads, often with one wheel off the bitumen. I decided that advice was needed as to where to go to get a new tyre, so I called into l'Image just after lunch was finished to get a local opinion. No-one understood me. No matter how hard I tried to say "pneus" or do a mime, the message wasn't getting through. Eventually Christophe emerged and I was able to ask in English. After making an appointment at the tyre place in Yzeures for Friday morning (they were busy Thursday afternoon) I returned home to check to see where I was going wrong with my pronunciation. Trust the French language - a letter that every other language ignores gets pronounced in French. 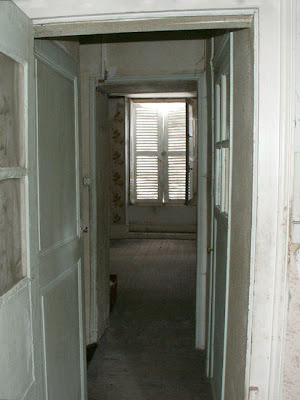 We have a very small bathroom at the top of the stairs in the house - about 1.4 x 1.8 metres (5'x6'). It contains a huge bath and a handbasin. This is not very practical, and so much water has been spilled from the bath in the past gazillion years that I suspect the floor would collapse if the bath was filled again. 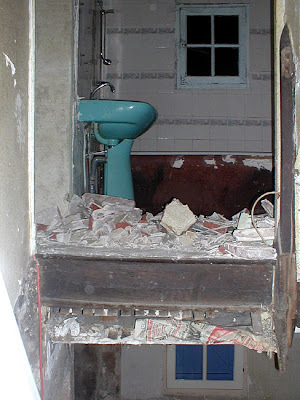 We have decided that this bathroom will have a WC and shower in it. At the moment, the way the door has been placed (right in the middle of the 1.8 metre wall) means that a shower unit would not fit. This means demolishing (that word again!) the wall, removing the bath and handbasin, replacing the floor (this time with water resistant particle board), installing the shower unit and WC and then building a new wall. 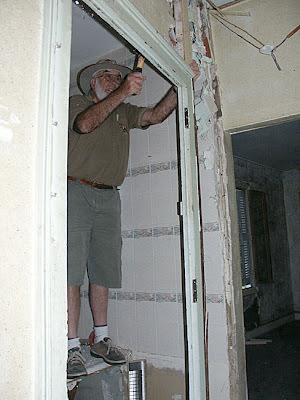 So far we have demolished the wall, which was made of very thin bricks. This photo looks weird, because you can see where the staircase should be. Yesterday's post about the Parc Floral should have been posted today, so here are the photos Susan didn't have to hand when she wrote it. You should have guessed............we can't type fast enough to do two posts a day! 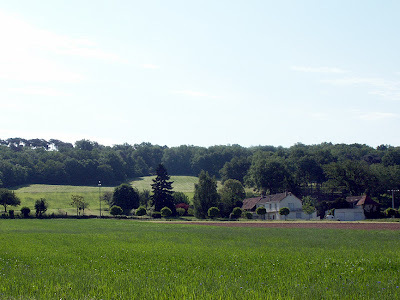 We are lucky enough to have as near neighbours in Preuilly J-P and Anne. 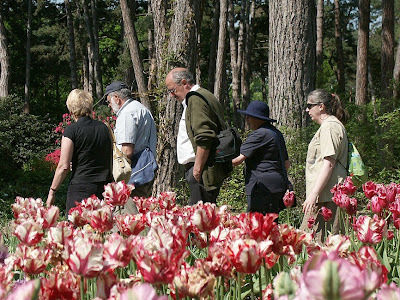 J-P is the recently retired Director of the Parc floral de Paris, a large garden laid out in the grounds of the Château de Vincennes on the south-eastern outskirts of Paris. 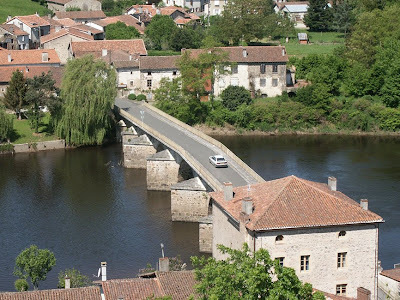 As they were going to be in Paris at the same time as us, and, we hoped, at the same time as the irises were blooming, we arranged to meet for a special guided tour. We set of from our hotel in the 19th, and two correspondences (Métro line changes) and half an hour later were at the end of the line (Château de Vincennes). 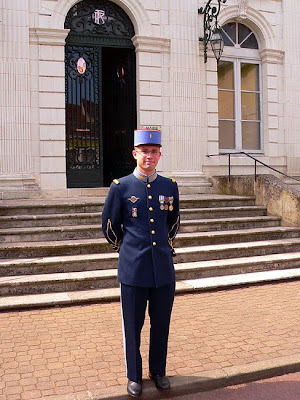 A 10 minute walk past the château itself on one side and the army barracks on the other and we were at the main gate of the Parc. After some minutes, the current Director, also J-P, came rushing out to say that his predecessor was held up in traffic. J-P 'jnr' escorted us into the Parc and gave us some background to its establishment and arrangement. It was created in 1969 as the principal venue for the 3rd International Flower Show and covers an area of 28 ha. J-P 'jnr' explained that the design of the Parc morphs from natural landscape with native vegetation to wooded parkland and then gradually becomes more and more a garden, with shrubberies and flower beds as you move further into the Parc. Until recently, there was a 1€ entrance fee, but this has now been waived. There is some concern that people may not be valuing what they don't have to pay for, leading to the plants not being respected and barbeques and ball games taking over. I must say we did not witness any of this unruly behaviour, but we did go there on a day when hundreds of slightly subdued 19 year olds were taking their Polytechnique exams in the Exhibition Hall. The very first tree we encountered was a tall slender thing dressed in salmon pink for the spring. It turned out to be a Toona, so related to Australian Red Cedar Toona ciliata. As we were discussing this, J-P 'snr' and Anne arrived and J-P 'jnr' rushed off to do important garden director things. We mooched slowly through the trees to the scented garden, with the lilacs providing the skeleton for an array of smaller plants. Just beyond this is the vegetable garden - not much happening here as it is too early, but the rainbow chard was looking lush. A couple of the staff were photographing a small lily and J-P 'snr' took some time out to chat to them, as he did with all the staff we met. 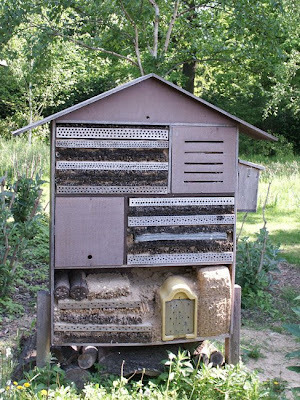 This area also had a prominently placed Insect Hotel, with plenty of occupants, mostly Red Mason Bee Osmia rufa, and a large pollarded Mulberry tree - not the sort that gives edible fruit, but the sort that the Silkworm Bombyx mori eats. Then we looked out over the Valley of Flowers, a great mound of bedding plants set in a natural hollow so that the display is seen to best advantage. Unfortunately, this was in the middle of its late spring change over, so we didn't linger. The current Head Gardener, who is responsible for this area, is a designer, not a plantsman, so I imagine the Valley of Flowers is really something when planted up. 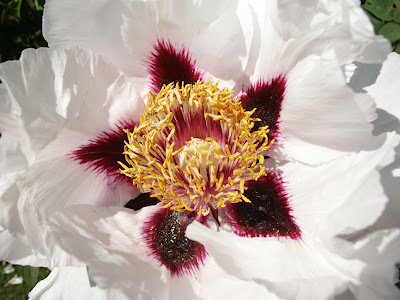 However, because he is not a plantsman, he apparently is prone to taking plants from other areas of the garden if they suit his design, no matter their rarity or value in the collection. Under J-P 'snr's 20 year tenure, this was a serious collecting garden, focusing on azaleas, peonies, geraniums, ferns, irises and probably other families or genera that I missed. A diversion through a greenhouse with palms, coffee and a Silky Oak Grevillea robusta, which caused some excitement, because it is native to the area my parents live in Australia, where it is widely used as a street tree, and as a much prized wood for making furniture. 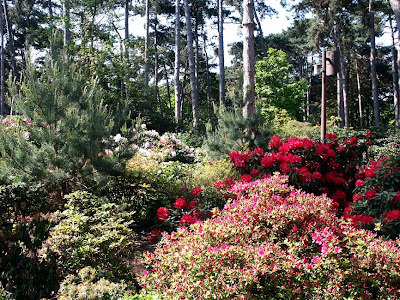 On to the azaleas, set amongst many varieties of magnolias, acers, pine and other trees. They are seriously poke yer eye out bright and clashing - a marvellous display. 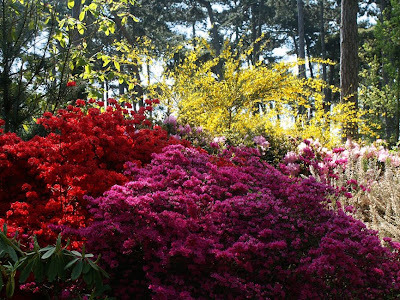 The soil is rather chalky so not really suitable for azaleas, so many tonnes of suitably acidic soil and compost has been brought in to ensure the azaleas thrive, and every year the soil is replenished to keep them healthy. We had just emerged from the azaleas when Simon tripped on a tree root and one of the lenses in his glasses fell out and smashed! He gamely spent the rest of the day spectacle free, and continued to take photos!! Bet you can't pick which are before and which are after! After picking up the pieces of shattered lens, we continued through an area planted in randomly shaped beds divided by wide smoothly curving grass paths, so that people could meander or lounge in amongst the plants. Anne proudly told us that this was one of J-P 'snr's innovations, in the English style. 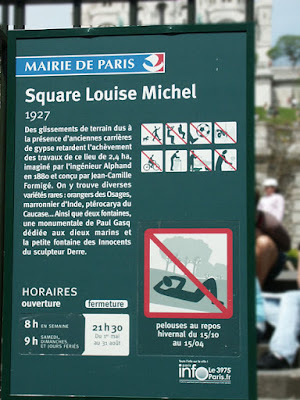 People were certainly using the area as intended, lying on the grass and relaxing (a naughty pleasure in Paris, as anyone who has been whistled at by a gardener or gendarme will know). Then there were some raised beds of tulips, just past their best, but in a wide range of tulip colours and forms. This led to some discussion about the Keukenhof gardens in Amsterdam, which my parents had been to see only a few days before. These amazing gardens are totally dedicated to spring bulbs and are only open while they are at their most beautiful. And this time it was J-P who pointed out another of his innovations - a portable rack for carrying and drying the tulip bulbs once lifted. Rather like a stretcher and apparently quite comfy if you felt a bit tired and could convince your colleagues to carry you back to the potting shed on it. The tulip beds were also being repaired as the bulbs were lifted. J-P commented that it is no longer affordable to create the raised beds using oak retainers, so the replacements are pine, which does not last so long - a bit of a Catch-22 - there is always a compromise to be made on one side in the triangular ratio of time:money:quality, as our blogger friend Henri very sagely pointed out to us once. Beyond the tulips, which Simon really liked, were beds of tree peonies. Wow!! 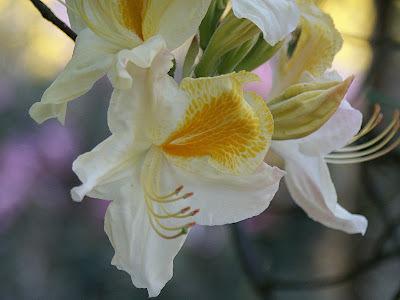 Enormous flowers and delicate scent, and being worked over by a variety of insects. The metallic green Rose Chafers Cetonia aurata really liked them, whilst the little brown fuzzball bee flies Bombylius major stuck to the Ajuga growing below. And then it was lunch time, in the restaurant, which as Anne says, is un bon rapport qualité/prix. Then it was through the cactus and desert plants greenhouse. J-P pointed out one cactus, about the size and shape of a basket ball with thick yellow spines. It's name in French is la chaise de la belle-mère (mother-in-law's chair). After that a greenhouse with some mur vegetal (vertical gardens) by the innovative garden designer Patrick Blanc. I have wanted to see his work since I 'discovered' him recently, but I didn't realise that the Parc floral had any until we stepped into this greenhouse. 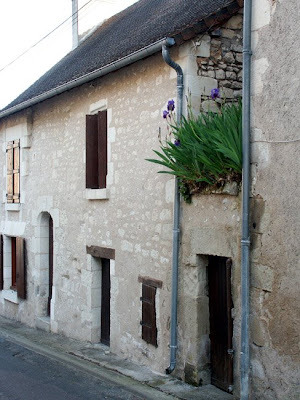 Anne pointed out to me that you need to live somewhere where the electricity supply is extremely reliable, as if the pump circulating the water through the felty stuff the plants grow out of on the wall fails then the plants die very quickly. The felt substrate was clearly visible here, and you could see the little pockets the plants sit in, which actually made it all the more interesting. I think perhaps the plants had not having achieved full growth for the season and will cover more later. They certainly looked healthy though, and some of the anthirriums were flowering in scarlet 'leather'. In this greenhouse there was also a display of very stylish, modern flower arrangements by a local florist. On from there to the very impressive Bonsai display. There was a security guard here, as there has been a problem in the past with valuable Bonsai plants being stolen by visitors who apparently just walked out with them. Some of the Bonsai had not made it through the winter, but they were still beautiful just as bare stems. Close by there is a bank of irises, which is what I had really come to see, but sod's law - they were not out yet. J-P 'snr' had been worried that if we came in late May they would be finished, so we visited early May, but because of the cold wet April, the irises were flowering late this year. This was J-P 'snr's first visit back to the park since he retired and he clearly found it difficult a couple of times when things were being done differently to how he would have approached it. The Parc is really his lifetime's work, and to give up this sort of vocational role is always a wrench. 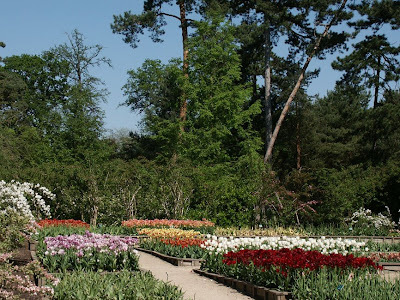 From the visitors' point of view, of course, very few of them will be serious plantsmen, and will come for the peaceful and beautiful surroundings. The bones of the garden will always remain - the tall pines, the mixture of shaded nooks and crannies and the open areas of lawn and the spectacular floral displays, so I think that those who know the Parc will continue to love it. And by now I guess you are all getting really concerned about how poor blind as a bat Simon is faring? 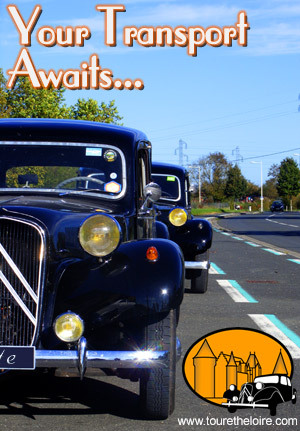 Well, J-P 'snr' very kindly took us to the local optometrist and they very kindly tested Simon's eyes and made a new pair of lenses which we went and collected the next morning, just in time for him to drive us all round one quarter of the péripherique and on to Preuilly. In a way, it was a blessing in disguise - he really needed new glasses, as his prescription had changed a lot. He adapted to the new glasses very quickly (just as well, or it would have been me driving the péri - eek!) and we are very impressed with French oculistes. I encounter pain d'épices (spice bread) at most fairs in the Touraine. 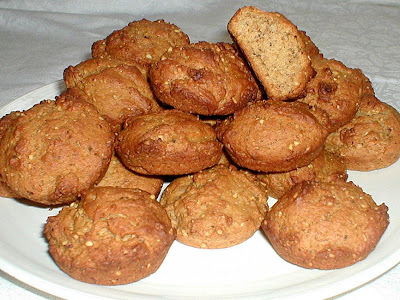 It is not actually a bread, but a spicy cake sweetened with honey and often containing nut meal. It is popular for breakfast, dipped into hot chocolate or coffee, or with a between meal cuppa. In our area, the locals consider the best pain d'épices is made with miel de sarrasin. Normally I am not a fan of cooking with honey, but there is no question that miel de sarrasin's very strong flavour combines perfectly with the nutmeg, cinnamon, cloves and ginger spices and toasted hazelnut meal that I used, resulting in a very distinctive taste that seems to me to be very northern European. Usually pain d'épices contains anise, but I omitted it as neither Simon nor I are huge fans of the taste, and the recipe could also include coriander, cumin or cardamom. 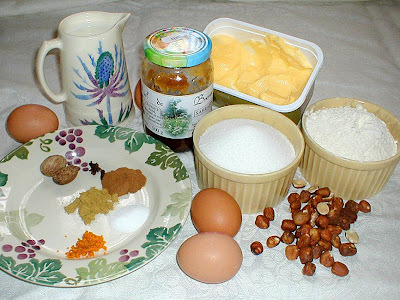 The ingredients for pain d'épices. I chose to make little individual cakes rather than a loaf. Mine are somewhat more rough hewn than the ones I see at the markets, where, if there are individual cakes on display, they are perfectly moulded little hearts in cellophane packets of three. 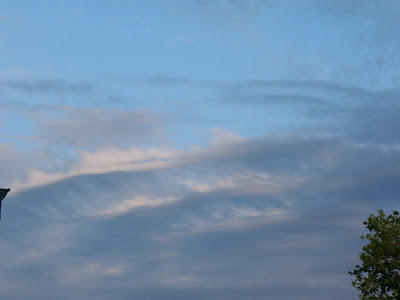 Certain people (you know who you are) have commented that they have never seen my photo on the blog. In addition to the cobbles in the back garden, we have a mystery concrete pad that stretches about half the length of the house and which is right up against the wall. 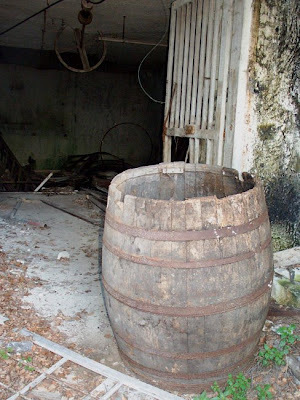 The well is incorporated into this. 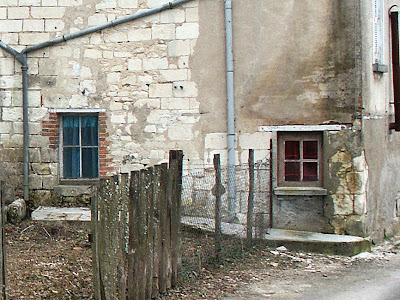 Concrete against the wall of a limestone house is not the best of ideas - it traps the water in the stone, and can dissolve it away. This is why we have always planned to remove it if we can. 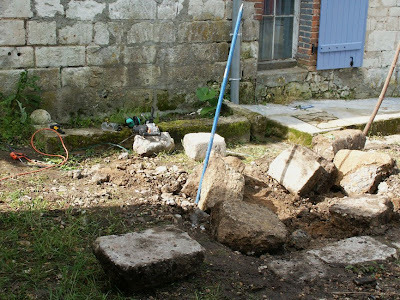 As I had my wrecking tools out for removing the cobbles, I decided to have a crack at the concrete too. My tools for breaking stuff. 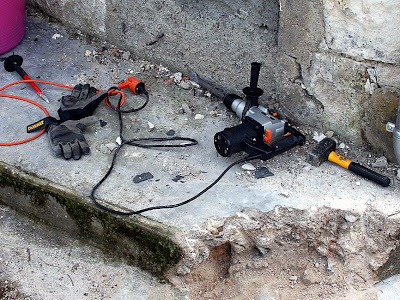 As mentioned before, I used the same tools for shifting the cobbles in the back garden. 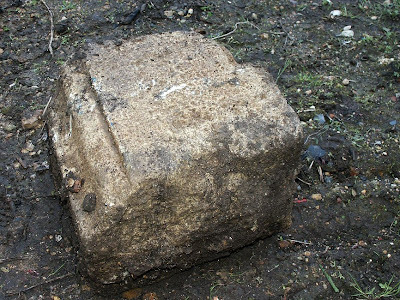 Here they are in use: and here is the carved stone that was face down and being used as a cobble. I don't know which church it was stolen from, but I assume it was the same church our window lintel came from.